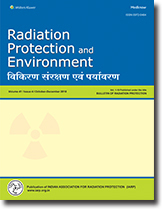 Radon concentration and gamma dose rates have been measured in different types of dwellings (94 dwellings) of the east coast of Tamil Nadu, India, on a quarterly basis using solid state nuclear track detectors and thermoluminescent dosimeters, respectively. Higher level of radon concentration is observed for winter season followed by spring, rainy, and summer seasons. On the contrary, the gamma dose rate for winter season is slightly lower than other three seasons. 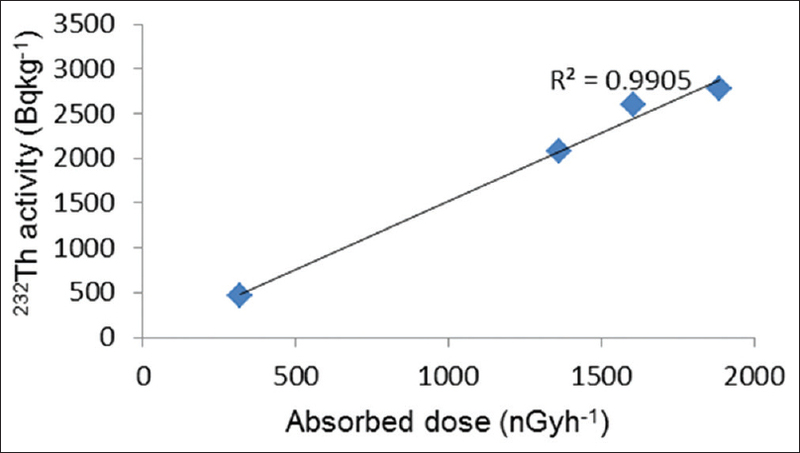 In this study, the average annual radon concentration (19.02 Bq/m3) is much lower than the recommended safe limit of 300 Bq/m3 while gamma dose rate (1.5 mGy/y) is much higher than the world average value of 0.520 mGy/y. 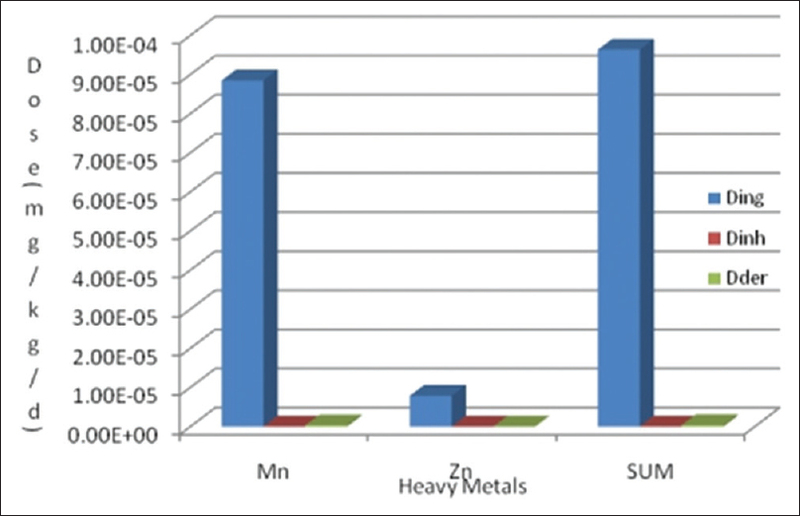 Mining activities cause disequilibrium in the bound states of heavy metals in rocks, soils and mineral ore. These heavy and toxic metals find their ways into the food chain thereby posing health risks along the chain. Furthermore, the work scenarios in mining activities have exposure pathways such as inadvertent ingestion and inhalation of dust and materials from the sites . The dose levels due to heavy metals in tantalite samples from Oke-Ogun, Oyo State have been estimated. Twelve samples of tantalite ore [(Fe, Mn) Ta2O6], were obtained from the mining sites. 500mg of the pulverized samples were pelletized for their elemental analysis using proton Induced X-ray Emission technique. 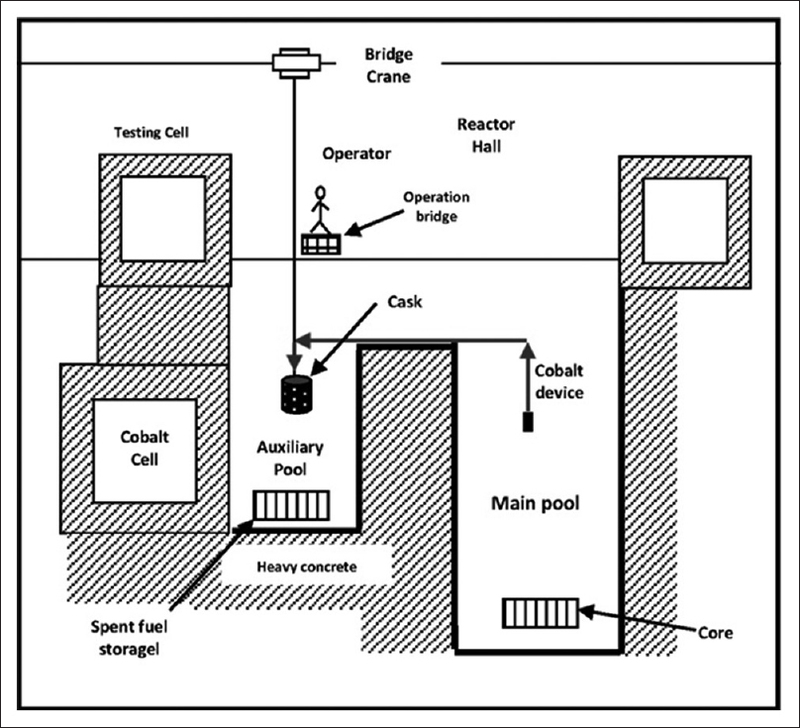 Hazard indices due to exposure to carcinogenic elements in Tantalite were estimated based on United State Environmental Protection Agency (USEPA) dose model. Chromium, Lead and Arsenic are the only carcinogenic elements found in the samples and average concentrations 311.05, 2533.26 and 127.35 ppm respectively and are higher than permissible limit recommended by Abundance elements in average crustal rock (AEACR) (100, 10.1 and 2-0 ppm respectively). The summation of hazard indices values estimated for carcinogenic elements are greater than unity. The estimated Life time average daily dose for the carcinogenic elements is 6.86E-06 mg/kg. The cancer risk estimated for the carcinogenic elements in Komu and Eluku is of the order Cr (1.32E-05) > Pb (5.83E-08). The total risk for these elements is 1.32E-05 and this value is within the permissible limit range of 10-4 - 10-6 recommended by USEPA, 1998. 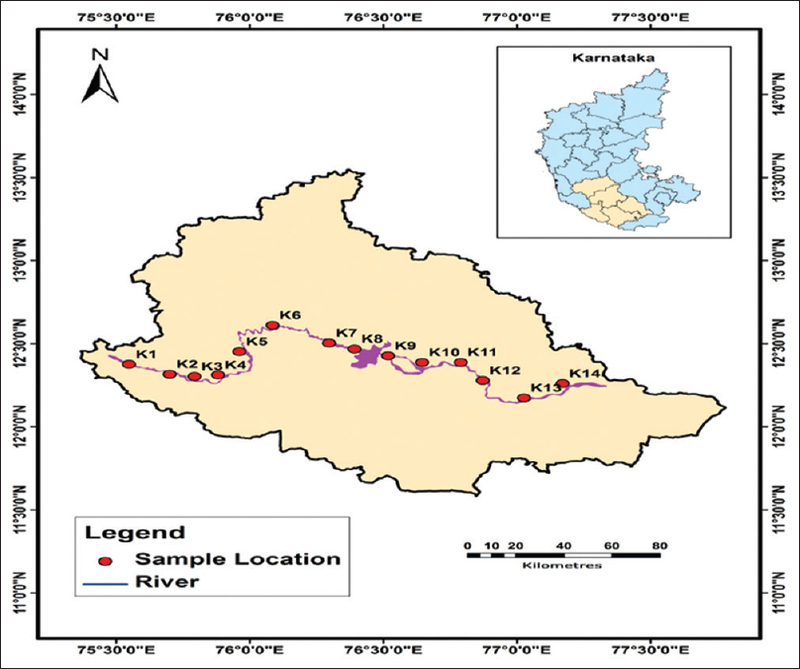 In the present study, sealed “can technique” using solid-state nuclear track detector (LR-115) films was employed to measure the radon exhalation rate and radium concentration in soil samples of Cauvery river environment. The mean values of radon activity, radon surface exhalation, and mass exhalation are 216.15 Bq m−3, 521.08 Bq m−1 h−1, and 247.21 mBq kg−1 h−1, respectively. The radium activity concentration and radon exhalation show good correlation. 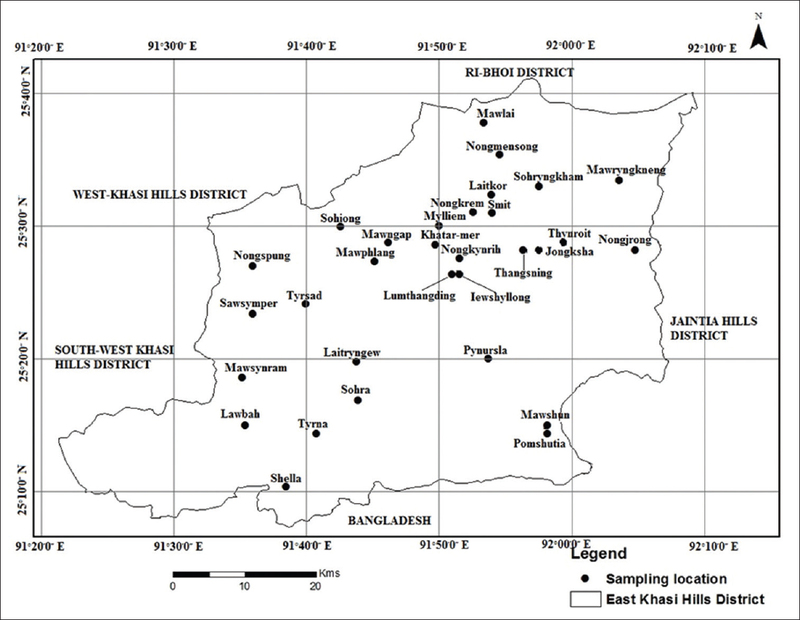 The activity concentrations of the natural radionuclides were measured from the soil samples of East Khasi Hills District of Meghalaya, India, using gamma-ray spectroscopy. The range of the activity concentrations determined for 40K, 226Ra, and 232Th in Bq/kg was 96.6–518.0, 27.2–122.1, and 39.2–153.4, respectively, and their respective average values were 221.0, 45.9, and 68.7. The range of outdoor annual effective dose was 53.1–209.3 μSv/y, with an average value of 88.2 μSv/y. The values of radium equivalent activity (Raeq) ranged from 96.5 to 265.4 Bq/kg. Values of Raeq from all the sampling locations were less than the recommended limit of 370 Bq/kg set by the Organization for Economic Cooperation and Development except in one location, Mylliem village. The study reveals that the soil samples from the selected, sampling villages, except Mylliem village, are safe and do not pose any significant radiological threat to population exposure. 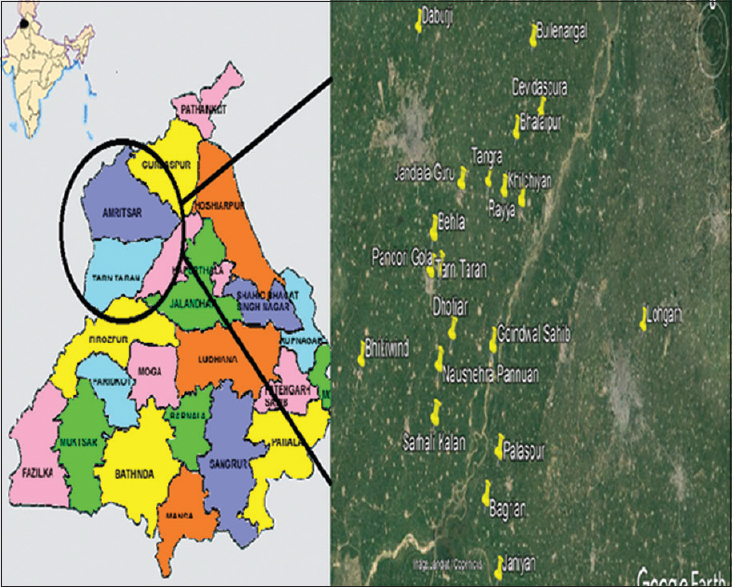 In the present study, the radon mass and thoron surface exhalation rates have been measured in the soil samples collected from the villages of the Amritsar and Tarn Taran districts of Punjab using the active portable device, i.e., SMART RnDuo monitor to quantify the level of rate of radon and thoron exhalation. The average values of radon mass exhalation rate were 20 ± 7 mBq kg−1 h−1 and 23 ± 5 mBq kg−1 h−1 in Amritsar and Tarn Taran districts, respectively. Similarly, the average value of thoron surface exhalation rate was 664 ± 237 Bq m−2 h−1 and 1531 ± 1503 Bq m−2 h−1 in Amritsar and Tarn Taran districts, respectively. The environment around us is radioactive due to background radiation emitted from the sky, earth's crust, food, water, and building materials. The human body gets exposed to radiation doses of about 82%, which are out of control; they arise from background radiation sources such as terrestrial, cosmic, and exposure to internal radiation. The background dose from cosmic radiation depends on the altitude, and regions with high altitude have high radiation doses. Natural radioactivity is present in the earth and is present in the different environment geological formations in the rocks and soils. Gamma radiation emitted from naturally occurring radioisotopes, such as 40K and the radionuclides from the 232Th and 238U series and their decay products which exist as trace levels in all ground formations, represents the main external source of irradiation to the human body. Their concentrations in rocks, soils, and sands depend on the local geology of each region in the world. Naturally occurring radioactive materials have terrestrial-origin radionuclides since the creation of the earth. The dose rate of background radiation increases because of the existence of some quarries and springs in some regions which are called high-level background radiation regions. The type of construction materials used in houses can be affecting the dose rate of background radiations. 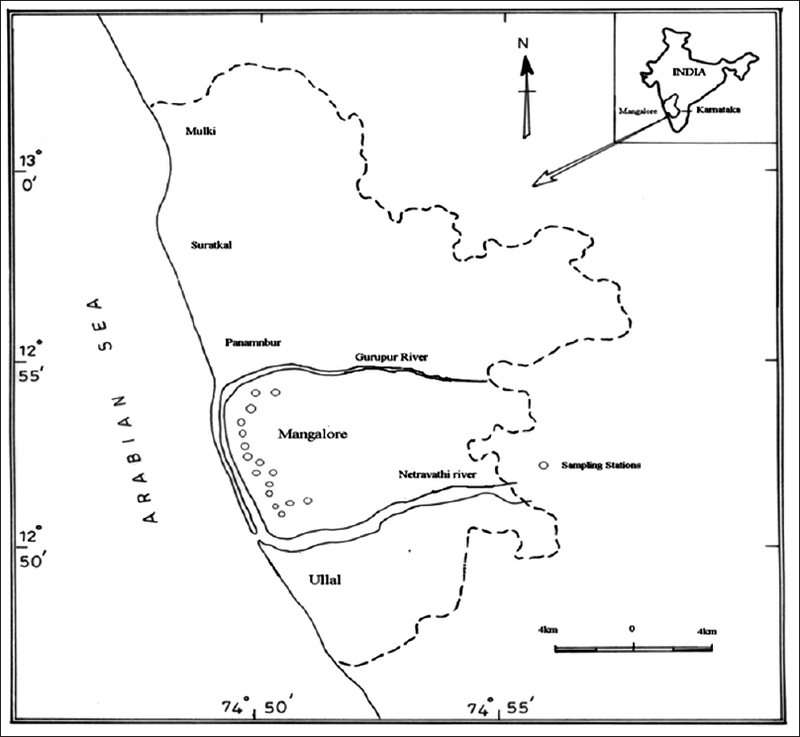 Study of radioactivity in the environment is important to monitor the levels of radiation to which human is exposed directly or indirectly. Recently, several international studies have been done and different values were measured. 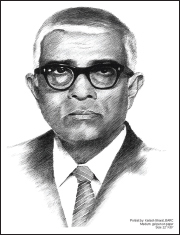 In this article, a review and literature survey of background radiations such as terrestrial, cosmic, and food radiation was carried out.